When done well, 'behind the scenes' content offers a unique glimpse into the people, ideas and processes that make an organization tick. And as the line between brand and culture grows increasingly blurred, taking audiences "behind the scenes" is proof positive that a business isn’t just preaching values, but actively practicing them. While many brands share their version of 'behind the scenes' content, for a narrative so entwined with a company’s unique culture, much of the content follows a pretty standardized formula. Common examples include: generic group photos from the annual company day of service, badly lit shots of leadership speaking from a podium or the ever popular close-up of a half eaten donut platter. The theme has become so diluted that in most cases, it conveys absolutely nothing about what actually happens behind the scenes. Instead, “behind the scenes” content is often the default, low-effort means to filling up the company social media feed. But like any form of content, "BTS" still requires thought, creativity and intention, particularly when trying to convey something as proprietary as company culture. Below are 5 examples of brands that have mastered 'behind the scenes' storytelling through their own distinct lens. The culture that powers online retailer Zappos, has quite literally been an open book, ever since CEO Tony Hsieh’s bestelling customer service manifesto Delivering Happiness was released 10 years ago. With their aptly titled Beyond the Box, Zappos turns the traditional website 'About' section into a dynamic newsroom of stories centered around the values that made them famous. The story of an endearing exchange between a Zappo’s CLT (Customer Loyalty Team) member and a caller ordering a new pair of Dansko’s for her nursing job caring for adults with special needs. A post highlighting some of the books in the company’s in-house library, all of which encompass at least one underlying theme of the company’s core values and are free for Zapponians to borrow, and even keep. A poignant video about an employee’s inspiring determination to live her best life, in spite of cancer. To my favorite, an update on a former Zappo’s CLT member living her dream as a musician, from a series titled “Life After Zappos". Agency content is notoriously unimaginative. Most will claim it’s because they’re too busy making magic for their clients, but what better opportunity to demonstrate your creative prowess than on your own brand? 72 and Sunny does just that, using their one of a kind culture as the basis for beautiful content. From their IG feed, the L.A. based agency offers a thoughtful glimpse behind the scenes from any of their five locations around the globe. It’s no secret that preppy fashion house J. Crew has struggled in recent years. But if their social media feeds are any indication, the brand is aiming for a return to basics, taking cues from radically transparent disruptors like Everlane. In their Behind the Design series, the iconic brand shares behind the scenes peeks into the creative and manufacturing process of some of their most lauded styles. Each story, available from both their website and Tumblr, offers a stripped down view of the craftsmanship and raw materials behind the clothes. A look at their limited edition paint splatter collection, all hand painted in NYC with the help of Parsons School of Design students. One of the hallmarks of GE’s creative strategy is their distinctive approach to photography. Through powerful, architectural images of it’s technologies, GE has managed to make art out of industrial machines. In their Tumblr hosted From the Factory Floor series, GE gives users an ultra high def view of the parts that power their manufacturing process. From thermal shields to turbine blades, everyday components come to life as sculptural works of art. And On YouTube via a series titled In The Wild, GE takes viewers to the places innovation actually happens, from "behind the scenes of some of their leading facilities". Hosted by Adam Savage of Tested and Innovation Nation's Alie Ward, the series demystifies the backend technology helping to power GE’s latest innovations. 'Behind the scenes' content can also be a powerful recruiting tool. From it’s Adobe Life platform, the famed software company shares a view of what it’s like to work at Adobe, centered around the perspective of their employees. They take an editorial approach to outlining employee benefits, like this post on their newly hired Executive Chef or a story about how a young associate was able to purchase her first home with the help of Adobe’s discounted stock purchase plan. 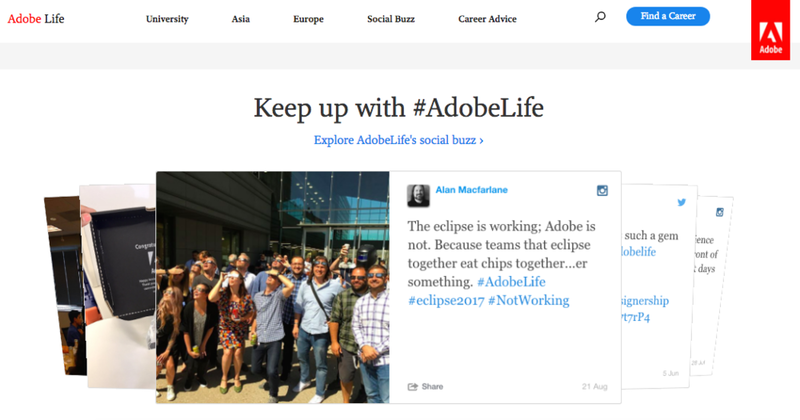 The platform also features a real-time social media feed powered by the #Adobelife hashtag plus employee contributed blog posts, via the 'A Day in the Adobe Life' blog. All of it is beautifully packaged inside their InDesign publishing software doubling as a brilliant product use case.